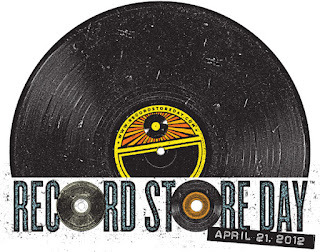 Record Store Day is tomorrow and if you don't know what that is, then you are terrible at being a fan of music! The organizers for Record Store Day have teamed up with almost every leading indie and even some major labels to release limited edition exclusives just for the occasion. Check out http://www.recordstoreday.com/ for the participating record stores and list of the exclusive releases. There are hundreds of exclusive and limited releases from other artists including Arcade Fire, M. Ward, Mastodon and the Flaming Lips, as well as a limited edition Reptar 7" on Black Bell Records! Thanks for supporting your local independent record stores! I will be in Cincinnati at Shake It Records. See ya there! UPDATE: I got all of the records on my list except the Misfits and Metallica. I just decided not to get them. I also got the Mynabirds 7" and Mae LP that were not on my list. Gotta say it was a good day.